Lend your bedroom a trendy look with this cushion cover. It comes in a floral print pattern that renders an elegant and classy look to your bed. Further, it is made from a premium quality fabric that ensures easy maintenance and a soft touch to your skin. Dimensions: 40 x 40 cms. 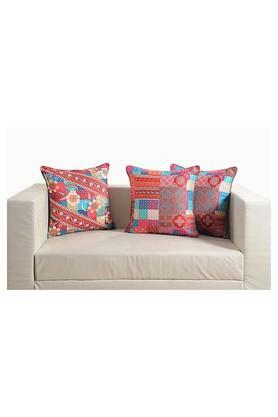 Dimensions: Cushion Cover - 40 x 40 cms. Stylise the look of your bedroom by using this cushion cover, which comes in a set of two from the coveted brand, Swayam.